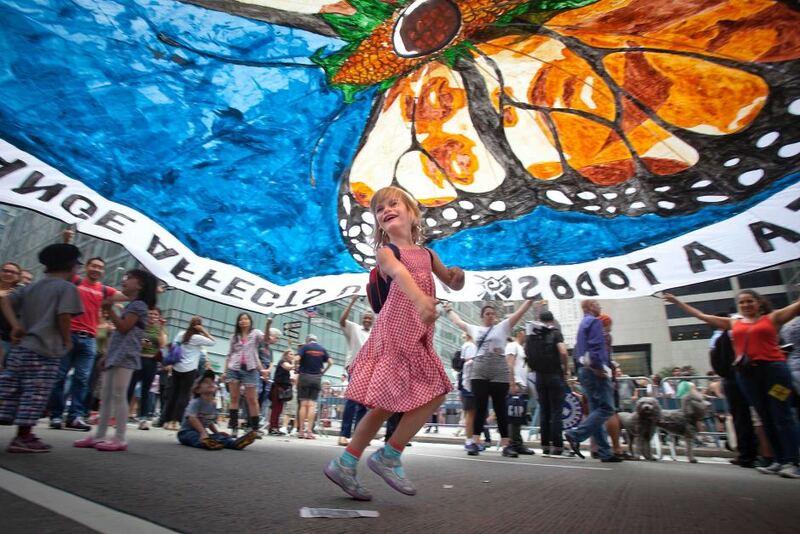 A girl dances under a protest parachute during the September 21, 2014 People’s Climate March. Photo: Carlo Allegri, Reuters. On this page, please find upcoming BCJN meetings and events, in reverse chronological order. All are free and open to the public. Please join us, and learn what we’re up to! For suggestions about climate-related events and meetings around the city, please visit the BCJN Blog. Between June 2016 — March 2017, BCJN substituted its monthly schedule of meetings with many other forms of activism. Please find brief descriptions of those activities below. 3/30/17, 11-noon: BCJN’s Food Justice Working Group helped to organize and participated in the “Cesar Chavez Rally for New York State Farm worker Rights” on the steps of NYC City Hall, in its ongoing work on the Steering Co. of Justice for Farm Workers. Ray Figueroa, president of the NYC Community Garden Coalition, spoke at BCJN’s invitation. 3/26/17, 3-5 pm: BCJN participated in a spring planning meeting of Friends of Tibbetts Tail. 3/25/17, 11-4 pm: BCJN participated in an important community project organized by partners Church of the Mediator and Community Assn. of Marble Hill, “Greening Up the Mediator,” a day of mulching in a multi-phase preparatory process in constructing a community urban farm on the south grounds of the Church of the Mediator, in the location of a former parking lot. 3/18/17: BCJN co-sponsored and participated in #DivestmentDay–Defund Dirty Energy, a Union Square, NYC protest followed by visits to local banks to close accounts in support of #DefundDAPL. Rick Chavolla of the American Indian Community House spoke, at BCJN’s invitation. With Grassroots Action NY and more. 3/17: BCJN participated in monthly meetings and a Town Hall of the Northwest Bronx Indivisible Group as part of its participation in local #ResistTrump efforts. 2/25/17: BCJN co-sponsored Verso Books panel in Brooklyn, “Fighting for the Climate in the Age of Trump,” a discussion of Standing Rock, climate change, the national pipeline struggle, and Indigenous rights. With Grassroots Action NY and The New Inquiry. 2/17: BCJN presented at the monthly meeting of the new local organization, Bronx Progressives. 2/15/17: BCJN joined a newly formed New York City DefundDAPL coalition, and signed an organization letter urging Mayor de Blasio to divest NYC from banks funding the Dakota Access Pipeline. 1/15/17: BCJN worked with others to ensure that the Peoples Climate Movement National Steering Co. issues a statement in solidarity with Standing Rock, and worked in collaboration with local Indigenous activists to encourage a strong NYC Indigenous turn-out at the April 29, 2017 Mobilization for Climate, Jobs, and Justice in Washington, D.C.
12/15/16: BCJN member and Taina elder and activist Vanessa Inaru gave a presentation to the Marble Hill Senior Center about the Standing Rock movement. Many members of the Senior Center are Taino (Indigenous Puerto Rican – Boriquen). 11/29/16, 5:30 pm: With Fordham University’s Dorothy Day Center for Service and Justice, BCJN’s Food Justice Working Group hosted a forum — “Food Justice in the Bronx” — at Fordham University, with speakers Raymond Figueroa, president, NYC Community Garden Coalition and Fordham U. Professor Garrett Broad, author of More Than Just Food: Food Justice and Community Change. 11/19/16: BCJN co-sponsored “This is Not a Drill: Stop SPECTRA from Hudson River Drilling,” another in a series of direct action protests to stop the Spectra Energy Co. from constructing the AIM fracked-gas pipeline 105 feet from critical infrastructure of the Indian Point nuclear power plant, 30 miles from NYC. 11/15/16: BCJN co-organized, with local 350.org affiliates, Indigenous organizations, and other environmental and justice groups, a major NYC protest — “NYC Call to Action: We Stand with #StandingRock” — at the U.S. Army Corps of Engineers offices in downtown Manhattan, demanding that ACE block the permit for Energy Transfer Partners to drill under the Missouri River. 3,000 participated; 39 were arrested in nonviolent direct action. Facebook event page HERE. 11/10/16, 7-10 pm: BCJN co-organized and co-hosted “Who Feeds the City?,” a fundraiser for the farmworker justice campaign of our partner, Rural & Migrant Ministry, at the Mayday Space in Brooklyn. 10/26/16: BCJN members joined hundreds at “It’s Now or Never, Senator Schumer,” a rally and nonviolent civil disobedience action at Senator Charles Schumer’s midtown Manhattan office to demand that he take action to shut down the AIM pipeline. BCJN members Cecile Lumer and Jennifer Scarlott were among 15 arrested while blocking a doorway to Senator Schumer’s building during the action. 10/23/16, 2-4 pm: BCJN held a General Meeting to discuss past work and upcoming plans at Church of the Mediator, W. 231st St. & Kingsbridge Avenue. 10/2/16: BCJN’s Green Vision Working Group, partnering with the Nature Group of Van Cortlandt Park, hosted a “walking meeting” in Van Cortlandt Park, to see and discuss daylighting Tibbett’s Brook and the Combined Sewer Overflow (CSO) problem in the Kingsbridge-Marble Hill area, the NYC Parks Department’s proposal to asphalt pave the Putnam Trail, and ramifications for the Class I wetland adjacent to it, and more. 9/15/16, 5:30-7 pm: BCJN launched its Solidarity with Standing Rock campaign with a #NoDAPL solidarity protest at TD Bank and Citibank in the Kingsbridge section of the Bronx attended by 60 including members of the New York State Nurses Association, local Taino activists, and members of the Marble Hill Senior Center. 8/12/16, 11:30-3 pm: BCJN’s Green Vision and Food Justice Working Groups, with its partner the Community Association of Marble Hill, and led by BCJN member and Bronx environmental activist and artist Alicia Grullon, organized a NW Bronx field trip to Swale, a floating food/forest barge at Concrete Park in the South Bronx. 8/4/16, 7 pm: BCJN promoted and participated in “Jews4BlackLives” rally and march in the Riverdale section of the Bronx, organized by Jews for Racial & Economic Justice. 7/17/16: BCJN joined with Bronx community partners including Mothers on the Move in organizing and participating in a #BlackLivesMatter #StopTheViolence march in the Hunts Point section of the Bronx, on the second anniversary of Eric Garner’s death. 6/29/16, 8:30 pm: The BCJN Film Series held a screening and discussion of “How to Let Go of the World and Love All the Things That Climate Can’t Change,” home of BCJN Steering Co. member Mary Hemings. BCJN’s Green Vision Working Group, Steering Co. and other members participated in planning and implementing monthly clean-ups and planting at Tibbett’s Tail Park, Bailey Avenue between W. 234-238th Sts., in the Kingsbridge section of the Bronx. BCJN is a member of Friends of Tibbett’s Tail. Between June 2016 — March 2017, BCJN substituted its monthly schedule of meetings with many other forms of activism. Please find brief descriptions of those activities above. 7:30-9:30 pm, Church of the Mediator, W. 231st St & Kingsbridge Ave.
10 am-all day, rally & lunch location tbd. The March will move through the NW Bronx from Washington Heights to Dobbs Ferry on Broadway. 7:45-9:30 pm, Riverdale-Yonkers Society for Ethical Culture, 4450 Fieldston Road. 3-4:30 pm, Conference call, please email bronxclimatejusticenorth@gmail.com for details. 5:30-7 pm, Riverdale-Yonkers Society for Ethical Culture, 4450 Fieldston Road, corner of Manhattan College Parkway. BCJN Film Screening & Discussion of new climate movement film “Disobedience” and Q&A re Break Free Albany, coming up on Saturday, May 14. 1-2:30 pm, Riverdale-Yonkers Society for Ethical Culture, 4450 Fieldston Road, corner of Manhattan College Parkway. 7:30-9:30 pm, Marble Hill Houses Community Center, 228th St. and Broadway. 2-5 pm, Christ Church Riverdale, 5030 Henry Hudson Parkway East @ W. 252nd St.
3-4:30 pm, Riverdale-Yonkers Society for Ethical Culture, 4450 Fieldston Road, corner of Manhattan College Parkway. 7:30-9:30 pm, Marble Hill Houses Community Center, 228th St and Broadway. 3-4:30 pm, Riverdale-Yonkers Society for Ethical Culture, 4450 Fieldston Road, corner of Manhattan College Parkway, basement meeting room. 5:30-7 pm, Riverdale-Yonkers Society for Ethical Culture, 4450 Fieldston Road, corner of Manhattan College Parkway, basement meeting room. 5:30 pm, Riverdale-Yonkers Society for Ethical Culture, 4450 Fieldston Road, corner of Manhattan College Parkway, basement meeting room. 3:00 pm, Riverdale-Yonkers Society for Ethical Culture, 4450 Fieldston Road, corner of Manhattan College Parkway, basement meeting room. NB: BCJN’s usual end-of-the-month general meetings will not happen in November or December due to the holiday season. Instead, we will have a combined Nov/Dec general meeting on 12/16, for details see December calendar above. NB: Congratulations to Energy Solutions for organizing BCJN’s first major public event, “Made in the Bronx: Green Buildings, Green Jobs,” on Saturday, November 14, 2-5 pm. Energy Solutions will not meet in November. See you on December 21 (details in December calendar above)! 3 pm, Riverdale Yonkers Society for Ethical Culture, 4450 Fieldston Road, corner of Manhattan College Parkway, Riverdale section of the Bronx. Refreshments. Donations welcome. The film is suitable for ages 12 and up. See the film website and trailer. 1:45-5 pm, Co-hosted by Manhattan College Center for Urban Resilience and Environmental Sustainability (CURES), Smith Auditorium on the Manhattan College campus. The event is free, but please register on Eventbrite, and join and invite friends on our Facebook event page. Please share widely! BCJN May General Meeting — Van Cortlandt Park Hike & Picnic! 7-9 pm, St. Stephen’s Church, 146 W. 228th St., Marble Hill, Bronx, (short walk from 225th or 231st St. stops on #1 train); Featured Speaker: Mark Dunlea, about the campaign to transition NYC and NYS to 100% renewables by 2030, followed by BCJN business. Mark’s bio: Mark Dunlea is a lifelong environmental and economic justice activist. He was a co-founder of NYPIRG and serves on the steering committee of 350nyc.org. He is active in the fossil fuel divestment campaign. As part of the Green Education and Legal Fund, he is helping to coordinate statewide efforts to have NYS transition to 100% Green Energy by 2030. He recently resigned as Executive Director of the Hunger Action Network of NYS after 29 years to focus on climate change. At this meeting, in addition to working group business, we’ll have a presentation followed by a discussion with Ms. Leslie Davis, a regional outreach coordinator with Solar One, a non-profit that works with NYSERDA (the NY State Energy Research and Development Authority), on community outreach on energy efficiency and the use of renewables in NYC buildings and neighborhoods. At 11 am, join BCJN and the Green Club to help with the Club’s annual Earth Day clean-up of Brust Park, located between Manhattan College and the Fieldston School, Riverdale section of the Bronx. Meet at the entrance to Brust Park, on Manhattan College Parkway, across the street from the main campus. Wear long pants, long sleeves, closed shoes, if possible bring gloves, trash bags, a broom, rake or garden shears. Clean-up cancelled in the event of rain. 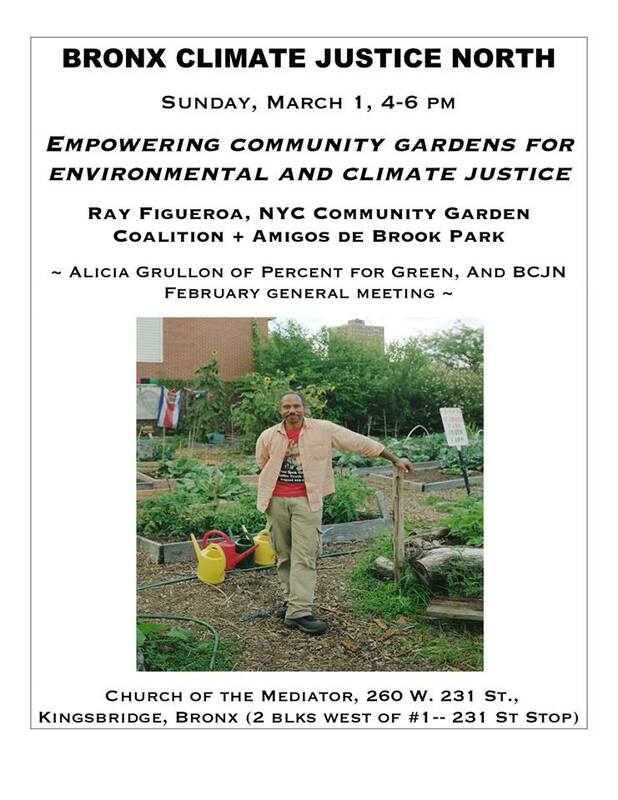 A flyer for a BCJN General Meeting featuring Ray Figueroa of New York City Community Garden Coalition and Alicia Grullon of Percent for Green.